What to do when your carpet is burned, stained, or discolored. You could simply move a large piece of furniture over the spot and forget about it. 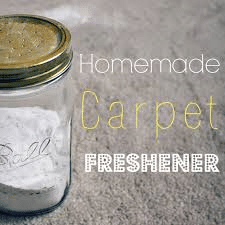 Maybe you could try some of the following simple methods to restore your carpet. To raise depressions left in a carpet by heavy furniture, try steaming. Hold a steam iron close enough for steam to reach the carpet, but don’t let the iron touch the fibers, especially if they are synthetic, because they could melt. Lift the fibers by scraping them with the edge of a coin or spoon. If a carpet thread is loose, snip it level with the pile. If you try to pull out the thread, you risk unraveling part of the carpet. If the spot remover you use alters the color of your carpet, try touching up small places with artists’ acrylic paint. If acrylic paint doesn’t work, try using a felt-tip marker or a permanent-ink marker of the appropriate color. Go slowly, and blend the color into the fibers. 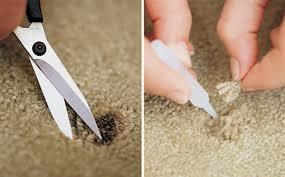 To repair a large burn in carpet, cut out the damaged area and substitute a patch of identical size and shape. Secure the new piece of carpeting with double-sided carpet tape or a latex adhesive. To repair a small area burned down to the carpet backing, snip off the charred fibers and put white glue in the opening. Then snip fibers from a scrap of carpet or an inconspicuous part of the carpet (perhaps in a closet). When the glue gets tacky, poke the fibers into place. If the burn isn’t all the way down to the backing, just snip off the charred tips of the fibers with scissors. The slightly shorter length of a few carpet fibers will never be noticed. Combine ingredients, and sprinkle over carpet. Allow to sit for a few minutes, then vacuum.